Mozart and The Sound of Music. These are the two things you have to mention when you talk about Salzburg. And yes, musical this town is - walking round the Heritage listed Altstadt you'll hear recitals drift from the many churches. Down side streets you'll hear snatches of classical music pouring from open windows. But Salzburg is also very beautiful, something Mozart himself was very proud of. Our pick of the best places to stay in Salzburg are all ideally to situated to make the most of all this beautiful city has to offer. Salzburg looks like she's been drawn specially for a child's picture book: the fortress surrounded by green mountains on all sides and below the bright colours and spires and domes of her cramped, cobbled centre. On the other side of the river Salzbach you'll find wider boulevards, grand municipal buildings and generous well kept parks. If you have a list of Salzburg's highlights already, go straight to our guru's list of recommendations. Otherwise here are some good reasons to visit, and some of the best places to stay in Salzburg to enjoy them. Translated to Old Town, this is where many of Salzburg's main attractions can be found and many visitors don't leave this district and the beautiful baroque architecture found there. Don't miss Festung Hohensalzburg (Castle), Salzburger Dom (Cathedral), and Salzburg Residenz (former home of the Prince-Archbishops who rules Salzburg). The obvious highlight is Mozart's birthplace at Getreidegasse 9. It's now a museum devoted to Mozart and his family. At Makartplatz 8 you'll find Mozarts Wohnhaus, or Mozart's Residence, another Mozart museum, famed for an exhibition of portraits. If you're interested in the new generation of Mozarts inspired by Salzburg, hang around the Mozarteum University of Music and Art, right beside Schloss Mirabell. If you only have a short time then definitely visit the Salzburg Residenz, definitely Schloss Mirabell and definitely Salzburger Dom. You should also find time to stroll in the parks and take in a concert. Take a walk on the Mönchsberg and enjoy the spectacular views. Visit the fantastic DomQuartier Museum. Stroll through the manicured Mirabell gardens (featured in The Sound of Music). Cycle the beautiful 3.5km route to Hellbrunn Palace. Visit Mozarts birthplace, residence and visit the Mozart Museum. 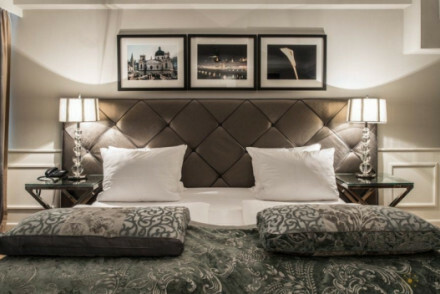 The Hotel Guru's selection of the best places to stay in Salzburg offers something for everyone, from the budget conscious to those seeking five star luxury on a grand scale. Right next to the cathedral, the Boutique Hotel Am Dom is the best place to stay if you don't want to walk far to see the sights. Converted from an 800 year old town house, it's decor is now quite modern. 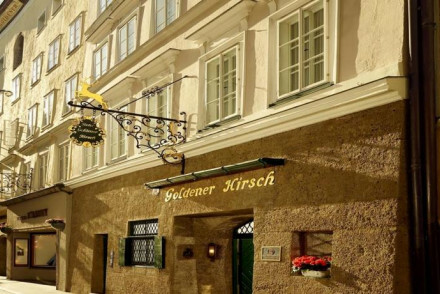 If you're looking for a more traditional hotel, the Goldener Hirsch is one of the best. Not quite as close to the Fortress but still well located. The generous buffet breakfast and renowned Nurnberger Bratwurstl will fuel the small extra distance you'll need to walk. 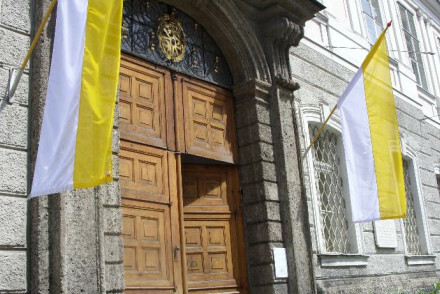 Primarily the home of novices training to become monks, Haus St Benedikt also opens its doors to regular folk. As you might imagine the bedrooms and minimalist, but include all the modern comforts. One of the highlights is breakfast which is taken communally with the monks! Only about two minutes from many of Salzburg's main attractions, this haven of calm is also one of the best places if you want a central base. Situated in a tastefully restored 800 year-old townhouse, Boutique Hotel am Dom boasts the perfect location from which to explore Salzburg. Rooms are sleek and contemporary, with historic features - bare stone and wooden beams. Mozart loved the view of Salzburg and staying at the Hotel Schloss Monchstein allows you to see it all spread out from your window. Rooms are fine and large and though its restaurant is small the standard is excellent. The modern spa, offering all kinds of treatments imaginable, makes it one of the best places to stay if your goal is to relax. Hotel Sacher Salzberg is one of the city's grandest hotels. An elegant timeless classic on the river Salzach. Beautiful wallpapered bedrooms and suites with marble bathrooms. Excellent traditional Austrian restaurant, spa, and spectacular views. 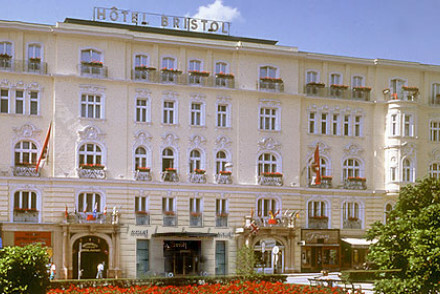 Hotel Bristol is a very smart Five Star hotel. Traditional elegance throughout classic rooms, suites, and apartments. Antiques, artworks, rich fabrics. Excellent restaurant and business centre. A romantic hilltop castle in an extensive park and gardens, with fine views over Salzburg. 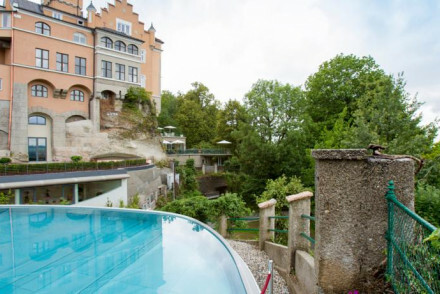 Hotel Schloss Monchstein boasts a gourmet dining and a top spa. Rooms are luxuriously finished, with priceless antiques and marble bathrooms. Arthotel Blau Gans is the perfect city break hotel. Converted from an ancient building, it is both charming and comfortably modern and clean. There's great art on the walls, the restaurant has a good reputation for excellent use of local produce and is popular with locals as well as guests. And it's centrally located. All adding up to make it one of the best places to stay on a city break. 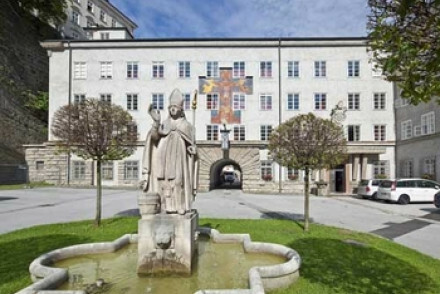 A charming hotel well located in a pedestrianised area of Salzburg. Hotel Goldgasse features individually styled rooms with playful design, frescoed walls, contemporary furniture and bold colours. This ancient though luxurious hotel oozes history, offering sophisticated service in a traditional Austrian setting. Authentic antiques, delicious cuisine and a cosy ambience makes Goldener Hirsch a top choice for a luxury stay. Hotel Stein is a chic contemporary hotel with panoramic views over the city from the terrace. Shiny, polished rooms and suites with parquet floors and modern furniture. This simple guest house, Gastehaus im Priesterseminar, has minimalist, comfortable bedrooms with large windows and en suite bathrooms. A great location just five minutes walk from the Mirabell Palace and Gardens. 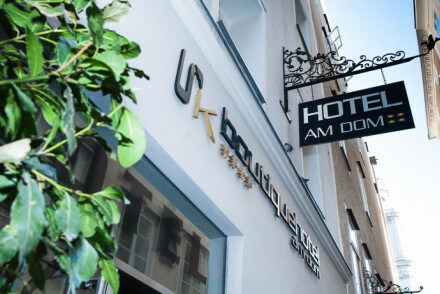 Hotel Krone 1512 is a lovely townhouse hotel with large sunlit rooms in contemporary design. Rooms, suites and an apartment with light parquet floors, large white beds and splashes of modern art. Hotel Rosenvilla wonderful hotel just outside the city centre. A traditional flower clad building with contemporary interiors. Romantic rooms and suites have four poster beds, lots of natural light, wooden floors and all the mod cons. 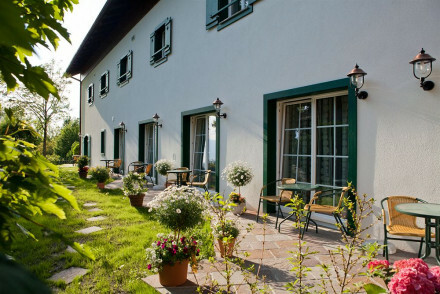 Hotel Pension Bloberger Hof is a lovely traditional hotel on the outskirts of Salzburg. Charmingly authentic living areas and bright rooms, suites, and an apartment. A great choice for honeymooners, couples or families. Die Gersberg Alm beautifully restored former Inn, just outside of Salzburg. The warm, welcoming and modern rooms boast excellent views from private balconies and large windows. A breathtaking Five Star hotel on the edge of a lake and at the foot of the mountains. Schloss Fuschl boasts stunning rooms and suites decorated to perfection; all the mod cons, sumptuous beds, impeccable style. Hotel Melanie offers contemporary and spacious rooms, ten minutes away from Wals' town centre. It's perfect for those looking to be active with an indoor pool, bikes available for free and plenty of local hiking trails. 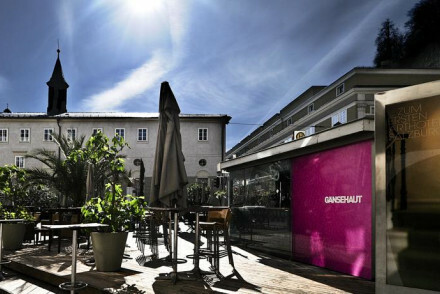 Romantik Hotel Gmachl is a chic hotel in a stunning mountain setting. Elegant rooms with beamed ceilings, parquet flooring and large windows open up onto gorgeous views. A fine restaurant serves Austrian haute cuisine amidst in elegant surrounds. Plus there is an expansive spa, ideal for relaxation after a day outdoors. Character abounds at the kooky family-run Arte Vida. Each individually decorated room bristles with boutique charm and Moroccan inspired furnishings. 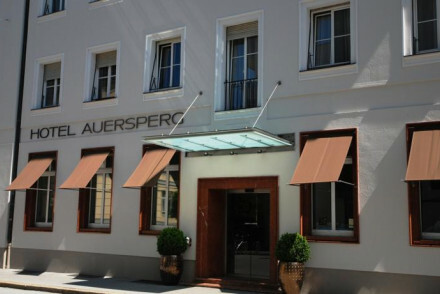 Hotel & Villa Auersperg is a charming, contemporary, family-run hotel. Guests can relax in the hotel spa or lie back on the charming garden terrace after a day of exploring the city. Bright modern decor, and great for families with young children. Arthotel Blaue Gans is a cool urban hideaway, with modern, bright rooms in a 14th century building. Decorated with over 100 original contemporary artworks - a beautiful contrast to the stuccoed ceilings and wooden floors. Suites are well equipped for families. For those who prefer to self cater when they're on holiday, we recommend a visit to our online partner Booking.com, where you'll find a full range for top notch luxury pads to cheap studios. Fly to Salzburg W.A. Mozart International Airport located 20 minutes from the city centre. Salzburg's railway station, the Hauptbahnhof, is well connected across Austria and Europe. Salzburg is a year round destination with each season offering its own charm however September and October are particularly nice months when the tourist crowds have reduced and the weather is still temperate. Expand your search to include all our recommendations in Vienna or Innsbruck. Alternatively contact one of our friendly gurus for additional help and advice. This simple guest house has minimalist, comfortable bedrooms with large windows and en suite bathrooms. A great location, just five minutes walk from the Mirabell Palace and Gardens. Fantastic for those on a budget looking to explore the surrounding Austrian beauty. A lovely townhouse hotel with large sunlit rooms in contemporary design. Rooms, suites and an apartment with light parquet floors, large white beds and splashes of modern art. The hotel has restaurants dotted over the city. A lovely spot, great value too. Sights nearby - Excellent location in the Linzer Grasse. All major sites are only minutes away on foot. A wonderful hotel just outside the city centre. A traditional flower clad building with contemporary interiors. Romantic rooms and suites have four poster beds, lots of natural light, wooden floors and all the mod cons. Fabulous breakfast room and garden. A tranquil city spot. Lively - The Salzburg festival every July provides concerts,operas, operettas, plays and readings. Sights nearby - Hohensalzburg Fortress, Hellbrunn Palace. 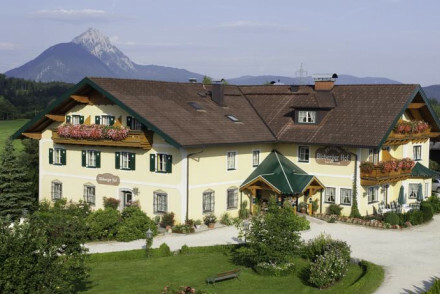 A lovely traditional hotel on the outskirts of Salzburg. Charmingly authentic living areas and bright rooms, suites, and an apartment. A great choice for honeymooners, couples or families. Great value too. A chic contemporary hotel with panoramic views over the city from the terrace. Shiny, polished rooms and suites with parquet floors and modern furniture. Good business facilities, child friendly and great lounge area. A good four star city option. Sights nearby - Excellent central location. All attractions within walking distance. Situated in a tastefully restored 800 year-old townhouse, Boutique Hotel am Dom boasts the perfect location from which to explore Salzburg. Rooms are sleek and contemporary, with historic features - bare stone and wooden beams. Some feature free-standing bathtubs. Modern comfort, ideally situated. This charming hotel, run by a religious order, is a haven of calm. Large simple rooms with just enough asceticism, and breakfast with the monks. Quiet, but minutes from the historic sites. A tranquil place for city adventurers to rest. Hideaway - A tranquil space, away from the hustle and bustle of the city set in the St Peter's Abbey complex. Great walks - Wander the narrow cobbled lanes of the Old Town, filled with fascinating sights and cafes. Sights nearby - Just minutes from the DOM, Fortress and Nonnberg Abbey. Character abounds at this kooky family-run guesthouse in Salzburg. Each individually decorated room bristles with boutique charm and Moroccan inspired furnishings. 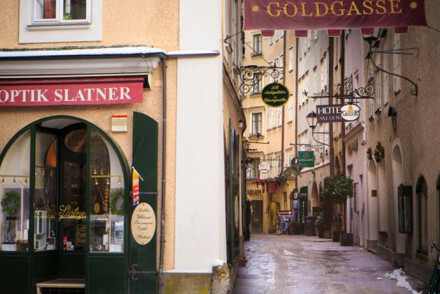 Just a short stroll from Mozart's house and the Sound of Music Tour, it's perfect for a family holiday in Salzburg. Families - With large sharing rooms, and a communal kitchen it's perfect for family's on the Von Trapp trail. Local exploring - Right in the heart of Salzburg, explore the beautiful home town of Mozart and the Sound of Music. Sights nearby - Two minutes walk from Mozart's birthplace, St. Sebastian's Church and Kapuzinerberg & Capuchin Monastery. Great walks - Take a day trip out of Salzburg and go walking near the beautiful surrounding lakes and mountains. A beautifully restored former Inn, just outside of Salzburg. The warm, welcoming and modern rooms boast excellent views from private balconies and large windows. Feast on traditional Austrian cuisine either in the dining room or on the terrace. The ideal family spot. Families - The perfect escape for families, in a quiet location with a playground and park, but only ten minutes from the centre. Local markets - Check out the crafts markets in Salzberg centre and pick up some souvenires. Great walks - Make a day trip to the stunning alpine pastures of the Salzkammergut. Charming, contemporary, family-run hotel. Guests can relax in the hotel spa or lie back on the charming garden terrace after a day of exploring the city. Bright modern decor, and great for families with young children - the hotel offers a range of service for a tranquil stay. Total relaxation - A relaxing haven in the city centre, with rooftop spa complete with sauna and steam room, and a leafy terrace for unwinding. Families - An ideal city escape for families, book large rooms in advance and rent bikes to explore the city. 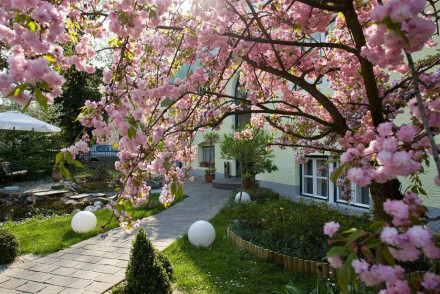 Sights nearby - Ideally located, close to the centre of Salzburg- the historic Old Town and the Mirabell Gardens can be reached by foot. Great walks - Recommended running and walking trails available from reception. One of Salzurg's grandest hotels. 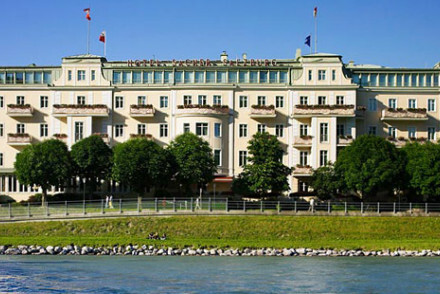 An elegant timeless classic on the river Salzach. Beautiful wallpapered bedrooms and suites with marble bathrooms. Excellent traditional Austrian restaurant, spa, and spectacular views. Very special. Views - Wonderful views over the river and city. Very smart Five Star hotel. Traditional elegance throughout classic rooms, suites, and apartments. Antiques, artworks, rich fabrics. Excellent restaurant and business centre. A great choice for the luxury traveller. Understated and serene. Sights nearby - A stone's throw from the Mirabell Palace and Festival houses. 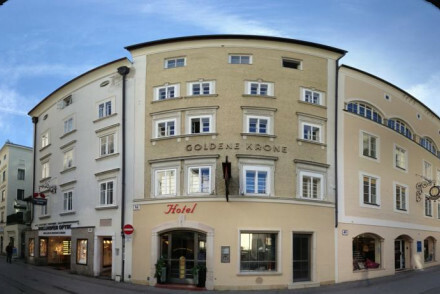 A charming hotel well located in a pedestrianised area of Salzburg. Individually styled rooms are playful in their design with frescoed walls, contemporary furniture and bold colours. A fine dining restaurant serves up exemplary local specialities. Well positioned for city exploring. A chic choice. Local exploring - Well located near the river and in a pedestrianised part of the city. Sights nearby - Make a trip to the impressive Mirabell Palace and gardens. This ancient though luxurious hotel oozes history, offering sophisticated service in a traditional Austrian setting. Authentic antiques, delicious cuisine and a cosy ambience make this the top choice for a luxury stay in Salzburg. City Style - A luxurious Salzburg institution- excellent service and romantic historical décor in the heart of the Old Town. Sights nearby - Just a few steps from Mozart's birthplace, Salzburg's main attraction. A cool urban hideaway, with modern, bright rooms in a 14th century building. Decorated with over 100 original contemporary artworks - a beautiful contrast to the stuccoed ceilings and wooden floors. Suites are well equipped for families. Ideally located at the foot of the Hohensalzburg Fortress. City Style - A chic 14th-century hotel that perfectly marries old and new with contemporary art, minimalist design and original features. Families - The Cityflat and Maisonette suites are ideal for families or large groups, within easy reach of the main sights. Sights nearby - Directly opposite the Festival Hall and just a few steps from Mozart’s Birthplace. Romantic hilltop castle in an extensive park and gardens, with fine views over Salzburg. Gourmet dining and a top spa. Rooms are luxuriously finished, with priceless antiques and marble bathrooms. A romantic 5 star retreat, popular for weddings and honeymoons.